(Nanowerk News) An international team of scientists has used a novel technique to measure, for the first time, the precise conditions at which certain ultrathin materials spontaneously become electrically polarized. The research provides the fundamental scientific basis for understanding this "ferroelectric" state in materials needed for next-generation "smart card" memory chips and other devices. The research is published in a recent issue of the journal Science. "We provide a complete picture of how the ferroelectric transition temperature changes when the electrical and mechanical conditions change within nanoscale ferroelectric materials," said Xiaoxing Xi, professor of physics and materials science and engineering at Penn State University, who led the research effort. The team is the first to use a technique known as ultraviolet Raman spectroscopy to reveal a range of temperatures, thicknesses, and structural configurations at which nanoscale barium titanate can store a switchable electric field. The scientists also performed theoretical calculations to predict the point at which materials transition into this ferroelectric state. The results of these calculations closely match the results of the team's experiments. "The work led by Xiaoxing Xi on nano-thick ferroelectric multilayers is groundbreaking," comments Refik Kortan, a program manager at the Basic Energy Sciences division of the U. S. Department of Energy, one of the sponsors of the U.S.-funded research project. "It is truly remarkable that UV-Raman can resolve displacements in ultrathin films that are just a few atomic layers thick." Other sponsors include the National Science Foundation, the Office of Naval Research, and the NASA. Various difficulties exist in fabricating materials that can retain their ferroelectric properties at small dimensions and at temperatures at or above room temperature. "How thin can a ferroelectric material be at room temperature?" is the fundamental question that lies at the root of efforts to determine how much data can be stored on next-generation electronic devices. "We found that a film of barium titanate (BaTiO3) whose thickness is just 4-tenths of a nanometer--or 4-hundred-millionths of a centimeter--can retain its ferroelectric properties when it is layered in thin sandwiches with non-ferroelectric layers of strontium titanate (SrTiO3)," said Darrell Schlom, professor of materials science and engineering at Penn State and a member of the research team. "This layer is just one molecule of barium titanate thick, the thinnest imaginable, but we have shown that it is ferroelectric at room temperature." Xi explains, "The ferroelectric layer can induce ferroelectric properties in neighboring layers that normally are not ferroelectric, especially in materials that are easily polarized. 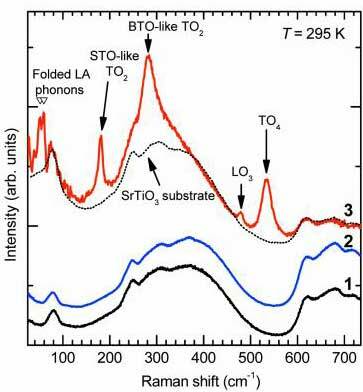 For example, we found that even one layer of ferroelectric barium titanate is capable of polarizing 13 adjacent layers of strontium titanate." The scientists found that they could manipulate ferroelectricity by imposing different kinds of electrical and mechanical boundary conditions. The electrical conditions include the degree of resistance to polarization of the nonferroelectric material. The mechanical conditions included sandwiching ferroelectric layers between different layers of other materials, which mechanically restricts the movement of the atoms. By varying the thickness and composition of the nanoscale thin films, the researchers were able to change the phase-transition temperature by almost 500 Kelvin, obtaining ferroelectric properties more than 350 Kelvin--over 600 degrees Fahrenheit--above room temperature. "Our research shows that, under favorable conditions, room-temperature ferroelectricity can be strong and stable in nanoscale systems," Xi said. The research team includes 22 scientists working in labs at Penn State, the University of Puerto Rico, the University of Wisconsin, the University of Michigan, Los Alamos National Laboratory, and Rutgers University in the United States, as well as at the National Atomic Energy Commission in Argentina and the University of Valencia in Spain. The collaboration grew over time with the addition of scientists who had access to the best high-performance Raman-spectroscopy devices and scientists who are specialists in materials fabrication, theoretical calculations, and structural characterization. "The number of names on this paper speaks well about teamwork and cooperation within and between different projects and across different universities," comments Lynnette Madsen, Program Director of Ceramics at the National Science Foundation. The team successfully tackled Xi's goal of using ultraviolet Raman spectroscopy to detect the moment when vanishingly thin layers of materials developed ferroelectric properties under a variety of conditions--a goal that leading experts in the field initially told him was so difficult that it was "impossible" to achieve. "Because most measurement techniques that work for thick films don't work well for films less than 100-nanometers thick, a new technique was needed, and I believed that UV-Raman spectroscopy should work," Xi explained. "Our record thinnest detections so far with UV-Raman spectroscopy are a layered superlattice film just 24-nanometers thick and a single-layer film just 10-nanometers thick." Raman spectroscopy is a technique that uses electromagnetic radiation to probe the properties of a material. The probe used in the technique is a photon--a quantum of light--which interacts in the material with a phonon--a quantum of sound. From the resulting change in the energy of the photon after it scatters off a material, scientists can measure the vibration energy of the lattice that is formed by the material's atoms. Typically, the radiation used for Raman spectroscopy has the energy of visible green light, but light with this energy is not absorbed effectively by nanoscale ferroelectric films, and so it does not reveal much information about them. Ultraviolet light, however, is able to be absorbed, so Xi reasoned that it could be used with the Raman-spectroscopy technique as an effective ferroelectricity detector for these nanoscale materials. "We can take advantage of the change in the symmetry of the nanoscale material's crystal structure that occurs at the ferroelectric phase transition," Xi said. "Because Raman spectroscopy cannot detect the phonon above the phase transition, but it can detect it after the material becomes ferroelectric, we can use this technique to detect the temperature at which the ferroelectric phase transition occurs." Ultraviolet Raman spectroscopy is a very new technology that is in the early stages of being developed, and few instruments exist that can achieve the resolution that Xi and his research colleagues require. "The number of photons that change their energies after interacting with phonons of lattice vibration is very small, and it is difficult to detect this weak signal at UV frequencies," Xi said. Xi overcame this obstacle by building a collaboration with scientists whose labs contained high-resolution UV Raman scattering systems, where his former postdoctoral fellow Dimitri Tenne, now an assistant professor of physics at Boise State University, made the measurements presented in the paper published in Science. "We have demonstrated that we can use UV Raman spectroscopy to discover more about the unusual phenomena that occur in ultrathin ferroelectric materials, and that it is possible to tune the ferroelectric properties of nanoscale materials by changing the electrical and mechanical boundary conditions," Xi said. "It is exciting to realize that this is just the beginning of a whole new field of research."